Parking and launching: Any resort on North Side or Township Park. Leg 1 (Level Intermediate), Drummond Island Yacht Haven to south end of Harbor Island, National Wildlife Refuge (NWR). 1.6 miles. Overnight on Mare or Cedar Island, with permit (state owned). Leg 2(Level advanced or Expert), Mare Island or Cedar Island to the docks on Lime Island. ~10.8 miles. Overnight on Lime Island cabins and tenting (Reservations required). ​Total miles one way: Drummond to Lime Island. 13.8 miles. for boaters crossing the U.S. and Canada borders. Recent legislation by the Canadian Federal Government has caused updates to the reporting requirements for both visiting and Canadian boaters. If you are the owner/operator of a private vessel carrying 29 people or less (read kayak) you are exempted from reporting to Canadian Border Service Agency when you are crossing the Border if you meet the following specified requirements. • Do NOT embark or disembark people or goods in Canada. What does this mean in layman’s terms? It means you can enjoy paddling across the border on your way to Lime Island. You can even float off shore and take photos, eat a snack or enjoy a break. But you can NOT step foot on Canadian soil for any reason. Doing so means checking in with Canadian customs, then returning to Drummond to check in with US Customs before continuing to Lime Island. Lime Island currently has camping platforms in two locations: (1) the dock area on the northwest end of the island has seven platforms. (2) The sandy beach on the southeast has four platforms facing St. Joseph Island and Fort St. Joseph. The camping platforms in the dock area have limited detailing suitable for rain/fly protection. These are fee sites. Cabins and camp sites can be reserved by calling the DNR at 906-635-5281. Drummond Island Yacht Haven to south end of Harbor Island, National Wildlife Refuge (NWR) ~ 1.6 miles. ​NOTE: Leaving from the Township Park will increase your mileage (~3.25 miles) and amount of time spent in open water with greater fetch. Harbor Island NWR is open for public use during daylight hours only and can be used for hiking, picnicking and swimming. No fires, no camping and no motorized vehicles are allowed. A complete description of the Island can be found on our ﻿Harbor Island﻿ page. Overnight on Mare Island or Cedar Island – both are part of the Harbor Island National Wildlife Refuge and State owned – with Camp Registration Card (PR 4134). Mare is the smaller of the two, but has the most accessible campsites. ​(this distance is from Mare to the docks on Lime Island. Overnight on Lime Island in cabins and tenting (Reservations required). When you leave Harbor Island NWR, go due west to the west side of Little Trout Island where you can visit the shipwreck J. C. FORD at N 46 02.664 W 83 50.280. Its big brass propeller can be seen from the surface. The Ford caught fire and sank on November 26, 1924. From Little Trout you can pick your route based on the wind/fetch. Many of the islands are privately owned and require permission from the homeowners prior to landing. Paddlers can enjoy the shelter offered by Canadian islands, but are reminded to not land. 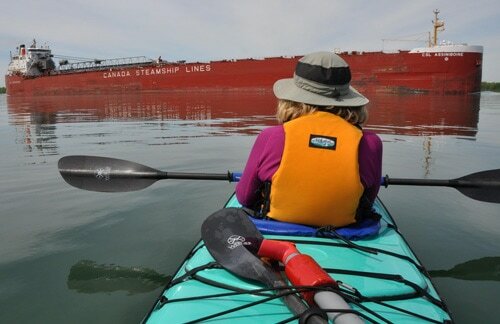 As you paddle northwest toward Lime Island the largest Canadian island along your route is St. Joseph Island. From your cockpit you will be able to view Fort St. Joseph – a Canadian National Historic Site. The fort was used to stage the attack on Mackinaw Island at the beginning of the War of 1812. It should be noted again that international travel requires meeting all U.S. Customs and Canadian requirements as outlined above. When coming around the south shore of Saint Joseph the island right in front of you is Lime Island with Little Lime Island seen just off the southern end. This distance is ~ 1-1/2 mile. Once there, travel the shoreline on the west side to the docks on the northeast end, a distance of little over 2 miles. At this point you can stay out of the main St. Mary’s shipping lane by hugging the west shore of Lime Island. ​Lime Island was never an official town, but did have a post office from 1891 to 1892, then reactivated in 1914 until about 1940. Even though never established as a town, the island once had a population of 100. The Island was used as a fueling station and dock operated by the Pittsburg Coal Company. There are two bunker fuel storage tanks on the Island near the dock. You can’t miss them. Following the trail north and past the bunker fuel tanks is a British era limekiln, a lime waste deposit, and limestone quarry. These archeological sites were related to the construction of Fort St. Joseph. In the 1840s, Lime Island was homesteaded and farmed. Later a resort hotel was constructed on the island and hosted Diamond Jim Brady and other notables. The island couldn’t compete with the likes of the Grand Hotel on Mackinaw Island, and the island became a refueling station for most of its history. As mentioned earlier, Lime Island has camping platforms in two locations: (1) The dock area on the northwest end of the island that has seven platforms. And (2) The sandy beach on the southeast that has four platforms facing St. Joseph Island and Fort St. Joseph. 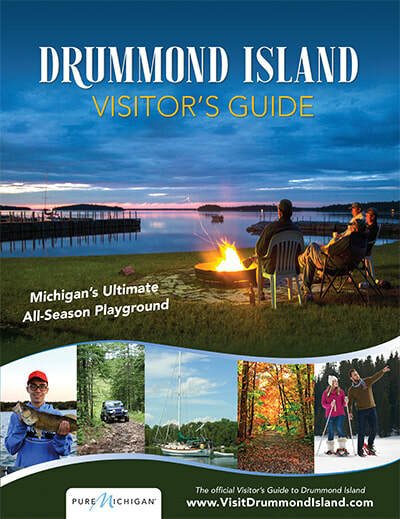 During this trip, you have visited Drummond Island – one of the largest fresh water Islands in the world – you have kayaked in and among its fifty plus outlying islands, bays and coves. You have walked the old growth oak and pine forest of Harbor Island National Wildlife Refuge and you have crossed an international border under your own steam. You have seen up close great ore carriers from the water’s edge. If this is not enough you may have walked nature trails, and picked a handful of berries or caught a stringer of fish for dinner. Maybe your best moment was seeing the large brass propeller from the shipwreck J.C. Ford or the Sandhill Crane you saw walking on Harbor Island, or maybe it was sitting on the dock at Lime Island with beverage in hand watching the sunset in the west. You ask a hundred paddlers what was there best moment and you get a hundred stories. What will your story be?